If, like me, you love space, you know that stars and planets-inspired decorations are awesome! That’s why, when I first saw one of these swanky new Moon night lights, I was super excited: finally manufacturers realized that stylish space-inspired decor can actually find its way into a modern, adult home. These sweet light globes have textured surfaces to look like the Moon. And they’re accurate too, so you can be a total badass by pointing out the Montes Apenninus range or the Tycho Crater to your friends. Most of these Moon lamps allow you to adjust their brightness levels, meaning they can be convenient, gentle nightstand lights to fall asleep to. Personally, I keep one in my living room, and I can’t tell you how many compliments I’ve gotten about it. What should I look for when buying a Moon night light? How many choices can there be? Turns out, quite a few. The best Moon night lights and Moon lamps have internal batteries (but you can also keep them plugged into a socket for continuous use). They also come in different sizes. So, I rounded up the best-selling Moon night lights on Amazon, along with a mini-review for each one of them, so you can choose the best Moon lamp for your needs. Note: These Moon night lights make for excellent Christmas presents or Birthday gifts for adults, but only the last two are gonna be better-suited for kids. The Moon night light by Mydethun is probably the most stylish lunar light available. The company sells Moon night lights in a few different sizes, but the smallest size Moon (3.5 inch globe) sits on a cool ceramic hand stand. The light features two different light colors (bright white, and a yellowish color), as well as 5 different brightness levels. You can adjust the color and the brightness with a switch located near the charging port. 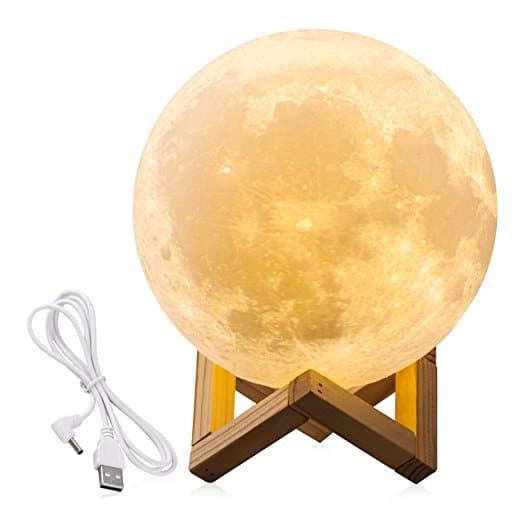 This Moon night light is powered by a small rechargeable battery (the USB charger is included), and it lasts over 8 hours on a single charge. Charging to 100% takes 2 to 3 hours only too. 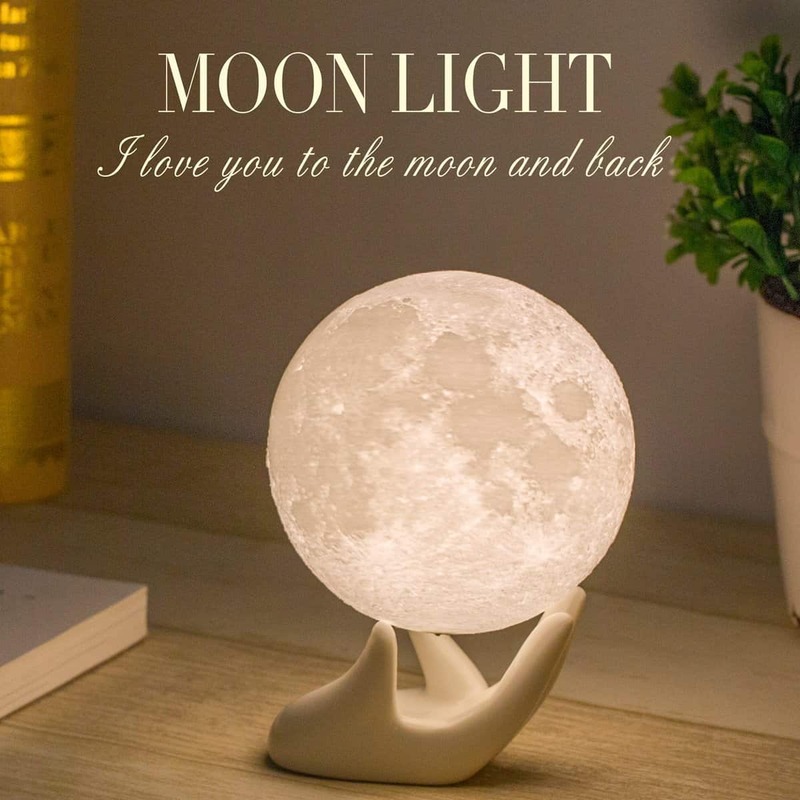 This moon lamp makes for a cute little gift but, because the ceramic holder is fragile, it may not be the best option for little ones. This moon lamp night light by CPLA features a large 7.1 inch Moon and sits on top of a sweet contemporary wooden stand. This lamp has a realistic looking texture, although at some angles you can see the 3d printing “layers”. The lamp has two levels of brightness, a bright white and a yellow. This lamp has a memory function to remember your last brightness setting. Like the others, it uses a USB cable to power it. Overall this large moon lamp is great for bedside tables, and the stand is very sturdy so it will work even for children’s rooms. This moon night light by Gahaya is a smaller Moon, with a size of 5.1 inches. but is just as beautiful as the real thing. This mini Moon lamp sits on top of a cool Scandinavian-looking wooden frame. Like the other Moon night lights, the light can be set to white or yellow and the brightness is also adjustable. 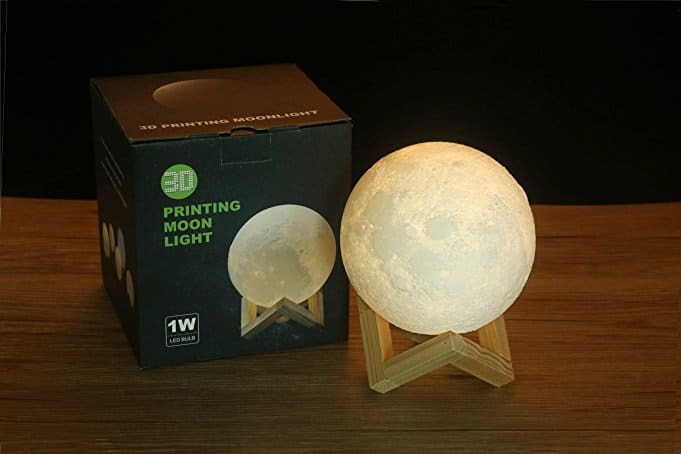 This Moon light is a great option for small nightstands or desks, and its smaller size makes it a great choice for younger kids to hold. If you are looking for a large moon night light, Gahaya also makes a 8.7 inch moon light, and a really cool moon pendant lamp. The best thing about this Moon lamp is that it’s got a very realistic “bumpy” moon texture.. I found myself holding this way more than is probably considered normal for an adult. Just saying. 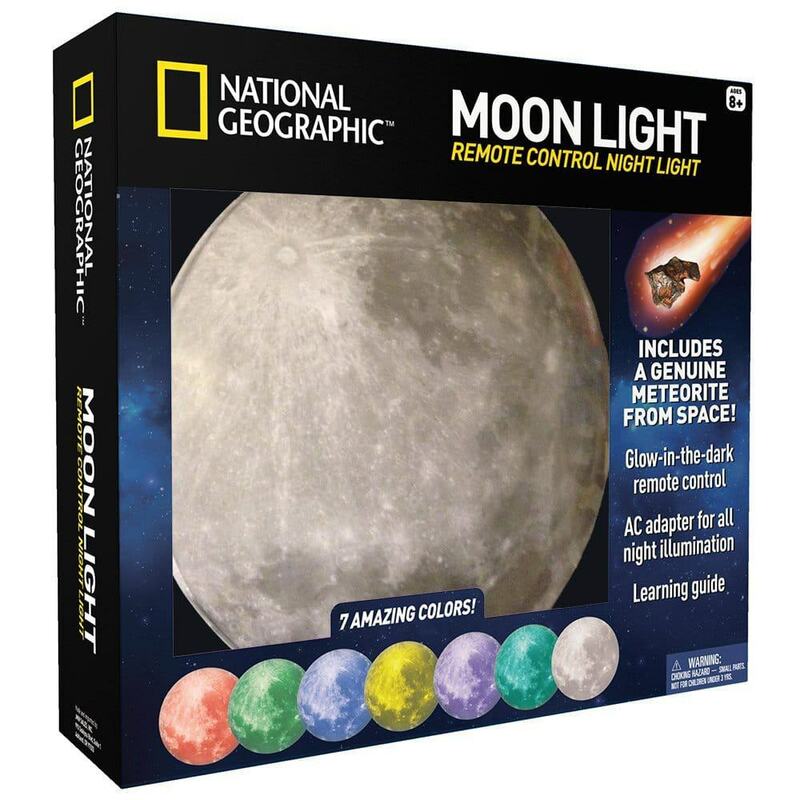 This Moon night light by National Geographic is a fun way to learn all about the Moon. Unlike the other Moon night lights, this one is not a globe, but rather a flat disc that mounts to your wall. It includes wall-safe adhesive to install it easily. The image of the Moon is a high quality photo taken by NASA, and the kit also includes a a real meteorite specimen for kids to enjoy. This Moon night light also comes with a glow-in-the-dark remote control (in the shape of a crescent moon – nice touch). It has a 20-minute sleep timer option, an AC adapter (or you can use batteries), and color shifting mode. As you can see, the colors are not just white and yellow, but all sorts of funky stuff like purple and green. It is great as a sleepy-time night light for space enthusiasts, and makes for a perfect present for kids. 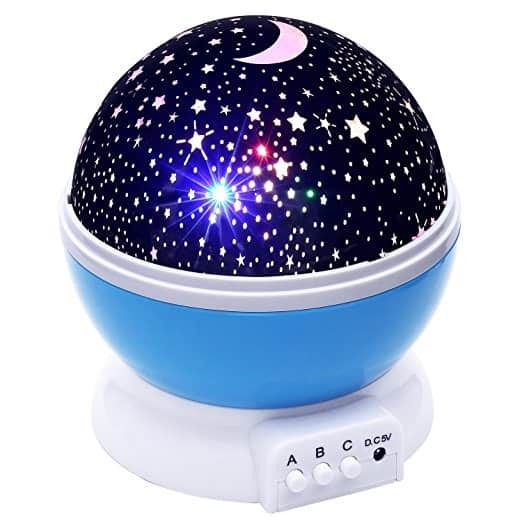 While not technically a Moon night light, I figured I’d add something for younger kids too: this adorable Baby night light by Lizber projects a beautiful starry sky all around the room for your baby to fall asleep to. The light show can be static or rotating, and the projected stars and planets can be set to one color, or a bunch of different ones. To power this little lamp, you can plug it into the wall with the included AC adapter, or use 4 AAA batteries. I gave this as a gift gift to a friend who’s a new mom, and she loves it: whenever the baby won’t sleep, she puts on the light show and the kid is what I can only describe as “entranced”. Basically, it works wonders to soothe crying babies to sleep. These are, in my opinion, the best Moon night lights and lamps for adults and children! Hope this helped you make a choice for your gift. Let me know which one you like best in the comments!